I bought an indoor dog container so the dog can go potty on it. I know they use rye grass and mulch. 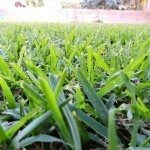 What kind of rye grass and mulch would mix together so it will grow and survive dog or cat urine inside?